Should You Refinish or Replace Your Old Hardwood Floors? The decision of whether to refinish or replace your hardwood floor will depend on a couple of factors. Hardwood flooring is designed to stand up to many years of high traffic and abuse. Over time, however, these floors become stained, warped, chipped, and dulled by time and normal wear and tear. When your floor starts looking worn out, you have two options – either refinish it or replace it. Deciding whether to refinish or replace your hardwood flooring will depend on several variables that you’ll need to consider carefully. Refinishing a wood floor is a great option if you’re simply looking to brighten it and restore its original sheen. But if you’re looking to change an aspect of the floor such as the style or species of the wood, the direction of the planks, or the consistency, a full replacement is necessary to achieve this. In other words, a simple restoration of your existing floor will only require a refinishing project, while a completely new look will need a replacement project. Consider the kind of damage your wood floor is showing. Not all kinds of damage can be remedied by refinishing it. For example, if several planks are damaged or if the floor is warped, to refinish it would only bring back the shine of a damaged floor. You might even notice the tongues where boards come together on older floors. This is a sign that you should get that floor replaced. If your floor is decades old, it may have been refinished several times already. If too much of the surface wood has been exposed, refinishing won’t have much of an effect and replacing may be the only option available. A wood floor refinishing project can actually take longer to complete than a full replacement job. 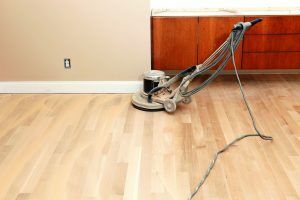 Due to the meticulous process involved in refinishing a floor the right way, this project might take as long as a week to complete, during which the floor surface needs to be completely untouched. This can prove a major hassle to you and your family. On the other hand, a full replacement can be done in considerably less time without the major inconveniences that a refinishing job entails. Trust Jason Brown Wood Floors for All Your Hardwood Flooring Needs! This entry was posted on Friday, January 20th, 2017 at 4:04 pm. Both comments and pings are currently closed.